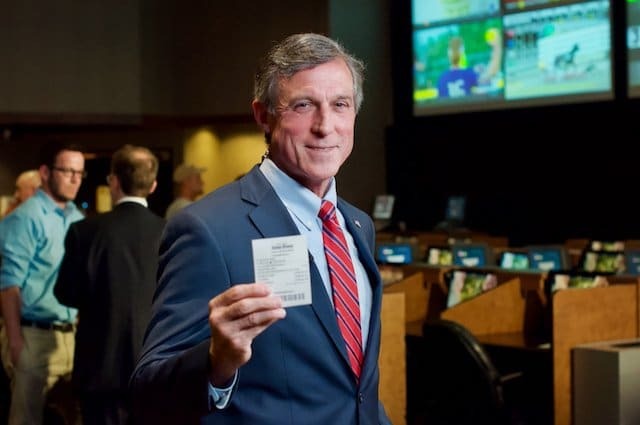 Governor John Carney officially placed the first single-game sports wager outside of Nevada at Delaware’s Dover Downs on Tuesday, just after 1:30 p.m., making the state the first since the Supreme Court struck down the Professional and Amateur Sports Protection Act, allowing states to offer full-fledged sports betting. The governor, who had his choice of placing a bet on professional baseball, football, hockey, basketball, soccer, golf, or auto racing, laid down $10 on the Philadelphia Phillies at the Chicago Cubs tonight. The bet, which capped off a jovial press conference, was delayed a bit as Carney, who was beaming and brimming with enthusiasm, patted down all of his pockets before he located the $10 bill he had tucked away for the bet. Governor Jay Carney Is First to Lay Down Legal DE Sports Bet, Putting $10 on the Phillies. Carney, who admitted to singing the Philadelphia Eagles fight song since they won the Super Bowl in February, was clearly thrilled to see the fruition of his and the state’s hard work. After the bet was made, all three of Delaware’s casinos – Dover Downs, Harrington Raceway and the Casino at Delaware Park were open for business. Delaware has long been preparing for single-game sports betting. 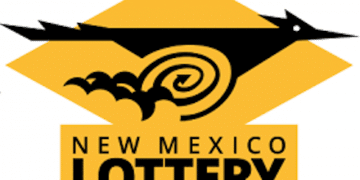 The state was one of three outside of Nevada that was grandfathered in under PASPA to have single-game sports wagering, and was prepared to do so in 2009. But that effort landed Delaware in the Third Circuit Court of Appeals against the pro sports leagues, which is where New Jersey eventually wound up as well in the battle that made its way to the Supreme Court. On Tuesday, Delaware’s Secretary of Finance Rick Eisenberg, echoed comments to Sports Handle from Delaware Lottery Director Vernon Kirk about the state’s preparedness to introduce sports wagering. Delaware has had a Legal Sports Betting Framework in Place Since 2009, and Needed Only a Few Weeks of Training and Review to Get DE Sports Betting Up and Running. Eisenberg said that since the Supreme Court decision on May 14, staff has been testing and developing software, training staff and even considering logos. He said the state has been training staff, at casinos, the state lottery and regulatory offices. 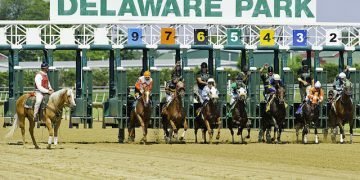 To that end, the first lines were posted at Delaware Park before 8 a.m. and potential bettors were gathered at all three casinos in anticipate of placing bets. As of now, sports betting in Delaware is limited to in-person wagers at the state’s three commercial casinos. And among the oddities of the rollout is this – bettors must be 18 to bet on horse races, but 21 to place a single-game sports bet. While Delaware will go down in history as the first post-PASPA state to have sports betting, it won’t be – like when it was the only state – alone for long. New Jersey’s Monmouth Park is planning to roll out sports betting as early as Friday, after both senate and assembly committees pushed through sports betting bills on Monday. A vote is expected in both chambers on Thursday. And Pennsylvania, which passed a sports betting law in 2017, has begun mapping out “temporary regulations” in order to get sports betting underway.